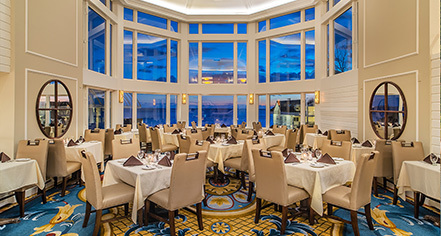 Dine with the best water view in Connecticut at Water’s Edge Resort and Spa. 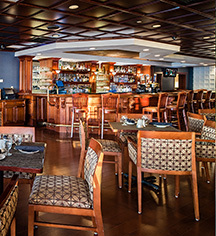 Take in the ambiance at one of the unique restaurants - Seaview Bistro, Sunset Bar & Grill, and Dattilo Fine Italian. Sample delicious cocktails, award-winning brunch, or one of Dattilo's authentic Italian entrees, which are all paired with outstanding service. Dattilo Fine Italian serves fresh, creative, and bold cuisine, presenting flavors reminiscent of old world Italy. In addition to a rich, authentic menu, the wine list is abundant and the service is seamless and attentive. Open for breakfast, lunch and dinner. Reservations recommended. A great choice for a light dinner, happy hour, or perhaps some late night bites, Seaview Bistro is open for lunch and dinner. Catch up with friends and relax with a crafty cocktail, martini, or blended tropical drink, while enjoying the live entertainment on Friday or Saturday night. The South Shore Crab Cakes are a must try and the Lobster Pizza brings Italy to a New England seafood classic. Enjoy casual New England Summer favorites paired with craft beers, signature cocktails, and spectacular views of Long Island Sound. The Sunset Bar & Grill offers seasonal outdoor dining for lunch and dinner. No better place to take in a fruity frozen cocktail than this outdoor venue with weekly entertainment. Jump start the day with a favorite hot (or iced) caffeinated drink from Cappuccio Café, conveniently located just off the hotel lobby. The café serves freshly brewed Illy coffee, lattes, espressos, and cappuccinos; gelatos in a variety of flavors; fresh fruit and yogurt smoothies; as well as handmade pastries, bagels, scones, and more.